BTO Bird Ringing - 'Demog Blog': It's Loony that we only get one a year! It's Loony that we only get one a year! 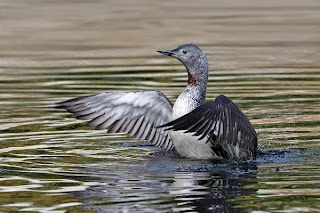 Birdfacts quote: "In Shetland Red-throated Divers were considered one of the best weather indicators, short cries (or flying inland) indicated fine weather, long, plaintive ones (or flying out to sea) wet weather." 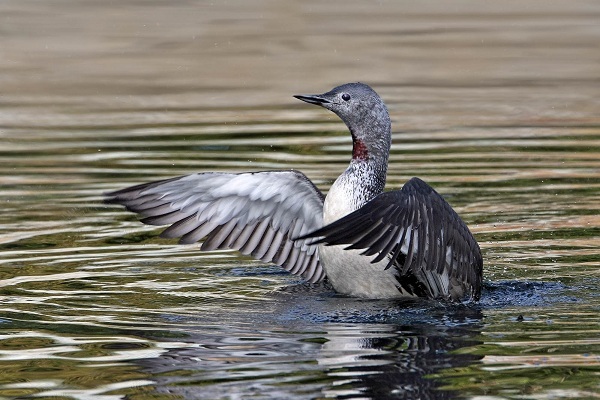 Although probably not a statistically significant weather predictor, the Red-throated Diver is an amazing bird. Occupying shallow ponds and lochs in Scotland during the summer and heading out to sea in winter, this bird is tricky to see, let alone ring, unless you live on Shetland, Orkney or the Western Isles. 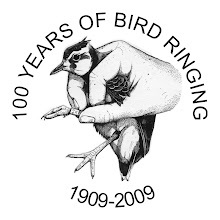 In 2010 we ringed 91 birds and all apart from three were ringed as chicks from broods of one or two. In 2010 we had one report of a Red-throated Diver, ringed in Sweden (red pin) on 31 July 1996 and found fresh dead on 6 February 2010 in North Wales (1326km). We have just heard that we have now had our annual quota of foreign ringed Red-throated Divers for 2011 in the form of a bird ringed in Finland (blue pin). This bird was ringed on 28 July 2008 and found dead on Stronsay, Orkney on 13 November 2011 (1753km). Thanks to Jill Pakenham for the photo.